Niki App – Get 20% Instant discount + Additional 10% Cashback via Amazon Pay balance. Experience the future! Niki is an all-in-one app, an AI-based personal assistant which helps you pay postpaid bill, electricity bill, book bus tickets and movie tickets online, utility bill payments, mobile recharge, book cabs at best prices, book bus, hotels and more. One coupon valid once per user. (Max discount is Rs 30 for Prepaid users). So Hurry up !! Update:- Sorry Guys, due to High Tension we forgot to Add Main Part of this Offer !! ?? 2. Install and Open the Freecharge/Niki App. Now Open your Freecharge App >> HomePage >> Scroll down >> Click on “Deals” and choose Online section >> Now Find different-different Niki deals, Buy the Voucher at Rs 1 only. 3. Login/Sign up your account on Niki App. 4. Goto Menu >> Apply Promocode >> Done. After Applying Initiate a Recharge of any amount. 5. You will get the 20% Instant discount (Max discount is Rs 30 for Prepaid users). 1. 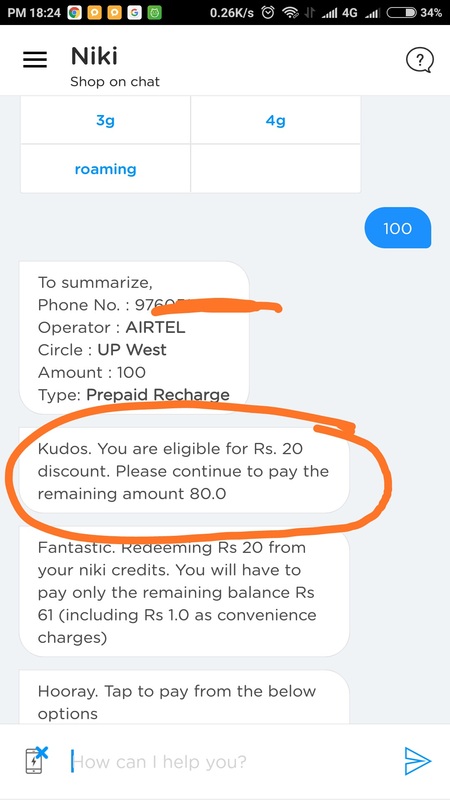 Get 20% upto Rs 30 Instant Discount on Prepaid Mobile Recharge on Niki App. 2. One coupon valid once per user. 3. Offer cannot be combined with existing running offers or promotions. 4. User can buy deal only once during the validity period. Sorry for the incomplete post.. i have update the Post with Full details. Don’t worry it will be successful in next 30-60 minutes.. else you will get Refund. but what solution about conveince fee? Any one tried if fc deal coupon is working on other than prepaid recharges like dth, utility bill etc. Why not purchase DTH Coupon from Freecharge deals Page? Read This Post for Full info about Amazon Niki offer. Bro, where are you finding the deals relating to latest apps, refer and earn programs etc. Do you find them from any other websites of this type or how?